We are interested in understanding how different plant species use different environmental cues (changes in temperature, photoperiod, light quality and light intensity) and internal cues (fruit load) to correctly time the transition to flowering. We have recently moved our focus to fruit trees. 1). How fruit load reduces flowering intensity, causing alternate bearing studying Olive and Apple. 2). 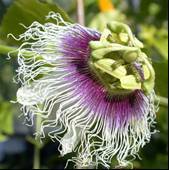 How increased temperature, fruit load and light intensity affect flower development and fruit set in (Passiflora edulis (Passion fruit). 3). Breeding new cultivars of Passionfruit. Cutri L, Nave N, Ben Ami M, Chayut N, Samach A, Dornelas MC. (2012) Evolutionary, genetic, environmental and hormonal-induced plasticity in the fate of organs arising from axillary meristems in Passiflora sp. Mechanisms of Development. In press. Samach A. (2012) Congratulations, you have been carefully chosen to represent an important developmental regulator! Annal.Bot. In press. Freiman A, Shlizerman L, Golobovitch S, Yablovitz Z, Korchinsky R, Cohen Y, Samach A, Chevreau E, Le Roux P-M, Patocchi A, Flaishman M. (2012) Development of a transgenic early flowering pear (Pyrus communis L.) genotype by RNAi silencing of PcTFL1-1 and PcTFL1 -2. Planta: 235: 1239-1251. Tiyayon P, Hegele M, Wunsche JN, Pongsriwat K, Sruamsiri P, Samach A. (2011) Studies on the molecular basis of flowering in Longan (Dimocarpus Longan). Acta Hort. 903: 979-985. Samach, A., and Lotan, H. (2007). The transition to flowering in tomato. Plant Biotechnology 24, In Press. Wenkel, S., Turck, F., Singer, K., Gissot, L., Le Gourrierec, J., Samach, A., and Coupland, G.(2006). CONSTANS and the CCAAT Box Binding Complex Share a Functionally Important Domain and Interact to Regulate Flowering of Arabidopsis. Plant Cell 18, 2971-2984. Ben-Naim, O., Eshed, R., Parnis, A., Teper-Bamnolker, P., Shalit, A., Coupland, G., Samach, A., and Lifschitz, E. (2006). The CCAAT binding factor can mediate between CONSTANS-like proteins and DNA. Plant Journal 46, 462-476. Hasdai, M., Weiss, B., Levi, A., Samach, A., and Porat, R. (2006). Differential responses of Arabidopsis ecotypes to cold, chilling and freezing temperatures. Annals of applied biology. 148: 113-120. Sapitnitskaya, M., Maul, P., McCollum, G.T., Guy, C.L., Weiss, B., Samach, A., and Porat, R. (2006). Postharvest Heat and Conditioning Treatments Activate Different Molecular Responses and Reduce Chilling Injuries in Grapefruit. J Exp Bot 57, 2943-2953. Paltiel, J., Amin, R., Gover, A., Ori, N., and Samach, A. (2006). Novel roles for GIGANTEA revealed under environmental conditions that modify its expression in Arabidopsis and Medicago truncatula. Planta 224, 1255-1268. Samach, A., and Wigge, P.A. (2005). Ambient temperature perception in plants. Current Opinion in Plant Biology 8, 483-486. Teper-Bamnolker, P., and Samach, A. (2005). The flowering integrator FT regulates SEPALLATA3 and FRUITFULL accumulation in Arabidopsis leaves. Plant Cell 17, 2661-2675. Yanai, O., Shani, E., Dolezal, K., Tarkowski, P., Sablowski, R., Sandberg, G., Samach, A., and Ori, N. (2005). Arabidopsis KNOXI Proteins Activate Cytokinin Biosynthesis. Curr Biol 15, 1566-1571. Porat, R., Rozenzvieg, D., Lurie, S., and Samach, A. (2005). Induction of chilling tolerance in grapefruit: Physiological and molecular aspects. Acta Hort. 682, 475-480. Valverde, F., Mouradov, A., Soppe, W., Ravenscroft, D., Samach, A., and Coupland, G. (2004). Photoreceptor regulation of CONSTANS protein in photoperiodic flowering. Science 303, 1003-1006. Goldschmidt, E.E., and Samach, A. (2004). Aspects of Flowering in Fruit trees. Acta Hort. 653, 23-27. Rozentzvieg, D., Elmaci, C., Samach, A., Lurie, S., and Porat, R. (2004). Isolation of four heat shock protein cDNAs from grapefruit peel tissue: possible relation to heat induced chilling tolerance response. Physiologia Plantarum 121, 421-428. Porat, R., Pasentsis, K., Rozentzvieg, D., Gerasopoulos, D., Falara, V., Samach, A., Lurie, S., and Kanellis, A.K. (2004). Isolation of a dehydrin cDNA from orange and grapefruit citrus fruit that is specifically induced by the combination of heat followed by chilling temperatures. Physiologia Plantarum 120, 256-264. Ben-Sadeh, H., and Samach, A. (2003). Nuclear DNA amounts. In " Encyclopedia of Rose Science (A. V. Roberts, T. Debener & S. Gudin, eds), Academic Press, Elsevier Science London, UK., 279-285. Samach, A., and Pineiro, M. (2002). Molecular Control of Light Sensing in Plant Development. A. Vainstein (ed.) Breeding For Ornamentals: Classical and Molecular Approaches. Kluwer Academic Publishers, Netherlands, 219-238. Samach, A., and Gover, A. (2001). Photoperiodism: The consistent use of CONSTANS. Curr Biol 11, R651-654. Bellaoui, M., Pidkowich, M.S., Samach, A., Kushalappa, K., Kohalmi, S.E., Modrusan, Z., Crosby, W.L., and Haughn, G.W. (2001). The Arabidopsis BELL1 and KNOX TALE homeodomain proteins interact through a domain conserved between plants and animals. Plant Cell 13, 2455-2470. Samach, A., and Coupland, G. (2000). Time measurement and the control of flowering in plants. Bioessays 22, 38-47. Samach, A., Onouchi, H., Gold, S.E., Ditta, G.S., Schwarz-Sommer, Z., Yanofsky, M.F., and Coupland, G. (2000). Distinct roles of CONSTANS target genes in reproductive development of Arabidopsis. Science 288, 1613-1616. Fowler, S., Lee, K., Onouchi, H., Samach, A., Richardson, K., Morris, B., Coupland, G., and Putterill, J. (1999). GIGANTEA: a circadian clock-controlled gene that regulates photoperiodic flowering in Arabidopsis and encodes a protein with several possible membrane-spanning domains. Embo J 18, 4679-4688. Samach, A., Klenz, J.E., Kohalmi, S.E., Risseeuw, E., Haughn, G.W., and Crosby, W.L. (1999). The UNUSUAL FLORAL ORGANS gene of Arabidopsis thaliana is an F-box protein required for normal patterning and growth in the floral meristem. Plant J 20, 433-445. Schaffer, R., Ramsay, N., Samach, A., Corden, S., Putterill, J., Carre, I.A., and Coupland, G. (1998). The late elongated hypocotyl mutation of Arabidopsis disrupts circadian rhythms and the photoperiodic control of flowering. Cell 93, 1219-1229. Samach, A., Kohalmi, S.E., Motte, P., Datla, R., and Haughn, G.W. (1997). Divergence of function and regulation of class B floral organ identity genes. Plant Cell 9, 559-570. Reiser, L., Modrusan, Z., Margossian, L., Samach, A., Ohad, N., Haughn, G.W., and Fischer, R.L. (1995). The BELL1 gene encodes a homeodomain protein involved in pattern formation in the Arabidopsis ovule primordium. Cell 83, 735-742. Samach, A., Broday, L., Hareven, D., and Lifschitz, E. (1995). Expression of an amino acid biosynthesis gene in tomato flowers: developmental upregulation and MeJa response are parenchyma-specific and mutually compatible. Plant J 8, 391-406. Samach, A., Hareven, D., Gutfinger, T., Ken-Dror, S., and Lifschitz, E. (1991). Biosynthetic threonine deaminase gene of tomato: isolation, structure, and upregulation in floral organs. Proc Natl Acad Sci U S A 88, 2678-2682.